Hire of instruments through the DLG eV. Following enquiries in the past as to whether the DLG could hire out instruments to those who would like to try out an instrument before making a purchase, we have started to build up a stock of instruments for loan. The inventory is made up of instruments that have been built collectively during the lute making courses of the DLG for the purpose of hiring (not available for purchase! ), instruments made available for hire via the DLG by lute makers (that may be available for purchase), and instruments that find their way to us by various other means (that also may be available for purchase). All instruments offered for hire are ready to play and will have been checked over by a lute maker. For each instrument there will be a personal contact through whom the loan will be managed. You do not need to be a member to borrow a lute from the DLG; we would, however, naturally welcome your membership. Perhaps you will be persuaded to take out membership when you have familiarised yourself with the instrument? At present, instruments are loaned out for a maximum of 6 months. If no further requests for the instrument loaned to you is received when the 6 months have elapsed, the loan period can be extended by one month at a time. The DLG e.V. has taken out instrument insurance with Mannheim Insurance, within the framework of the “SINFONIMA” package that is tailored to the requirements of musicians. This will cover many risks, including some occurring in transporting the instrument. You will obtain the exact terms of the insurance with the contract paperwork. Naturally, the insurance that we have arranged does not exonerate you from the duty of care in looking after the instrument. 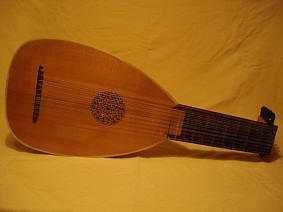 10-course renaissance lute, built by Winfried Heitland 1980. 9-rips mould from flamed maple, matt painted. Spruce soundboard with parchment binding 46 cm x 30,6 cm. fingerboard length 26,8 cm, width 10 cm / 8,4 cm. 8 fingerboard frets, 4 soundboard frets. Fitting case from Fa. Meinel. 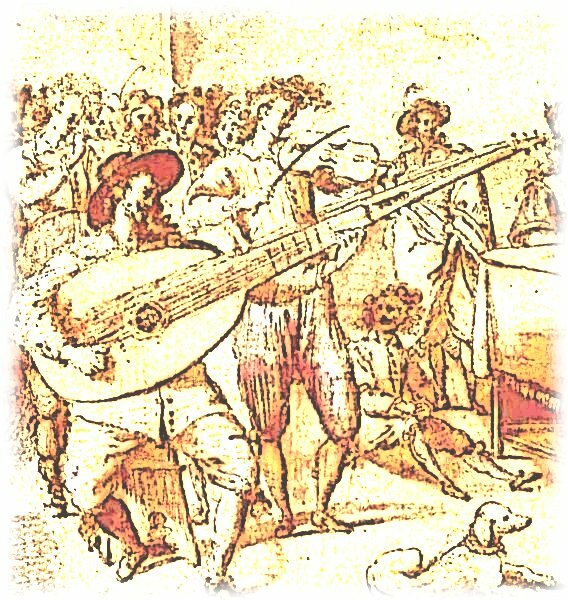 8-course renaissance lute built by Martin Majewsky, Heribert Steinheuer, Michael Treder and Günter Mark in 2005. 11-rips mould from yew with black spacers. Spruce soundboard 453 mm x 318 mm. Pegbox and neck veneered with ebony. Arciliuto, mould after Pietro Raillich 1669, built by Wolfgang Emmerich in 2015. String length 64,5 cm / 121,5 cm. 21-rips mould from yellow ceder with ebony spacers. Spruce soundboard with ebony binding 45 cm x 29,3 cm. Fingerboard length 29,5 cm, width (saddle) 7,5 cm. 9 fingerboard frets, 3 soundboard frets. Fitting case from Fa. Götz. Theorbo, mould after „Giovanni Tesler Ancona“ 1615, built by Wolfgang Emmerich. String length 85,5 cm / 163 cm. 65-rips mould from rosewood with maple spacers. Ebony, rosewood and pao rosa veneered neck. 6-course Mandora after G.F.Wenger 1748, built by Vinzenz Bachmayer in 2018. 11-rips mould from flamed maple with rosewood spacers. Neck and pegbox veneered with rosewood. Please refer any interest in lutes for children to Günter Mark. Monthly rental 40.00 Euro per instrument (minus 20% for society members). 350.00 Euro (minus 20% for society members). To check whether the instrument is currently available, please ask the appropriate contact. On request, and if necessary, you will be placed on a waiting list. The details of the hire conditions and for the care of the instrument can be obtained from Günter Mark (address above). If you are interested in hiring one of the instruments offered via the DLG eV, please get in touch with the contact given above for each instrument in question. You will obtain further information from her/him, together with the hire agreement. We wish you lots of enjoyment with our instruments and hope that in this way we can facilitate your introduction into a wonderful musical world. Incidentally: on our homepage you will also find a page with information on lute teachers. We would like to point out that, currently, several lute-family instruments are being offered for hire outside the auspices of the DLC. You can find further information on www.saitenspiel-zeug.de under "Mietinstrumente" (Instruments for hire).